I would be remiss if I didn't try out at least one recipe from Melissa Joulwan's Well Fed 2's "Burgers, Balls & Bangers" section. As it was getting close to Thanksgiving and I'm still too chicken to cook the turkey in my deep freeze, the Turkey and Cranberry recipe seemed like a good choice. I gathered my ingredients, turned my oven on to pre-heat and got to work. After mixing up some cream of tartar, baking soda and water, I juiced an orange and zested a bit of it. 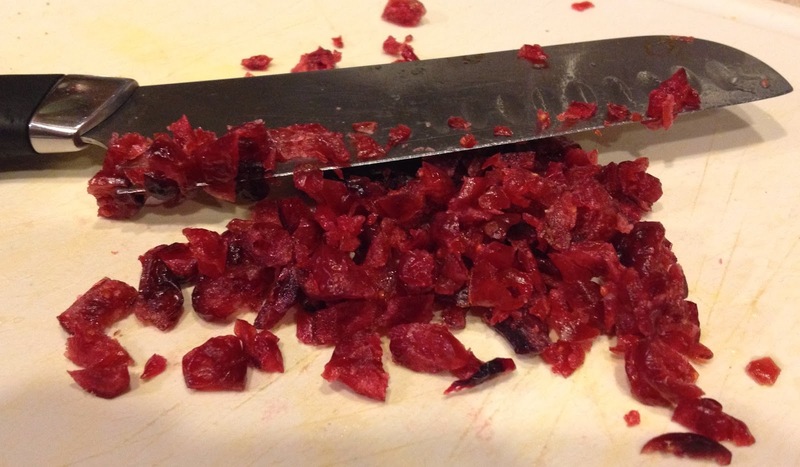 Next up, chopping up the dried cranberries. And finally, you mix everything up in a bowl. 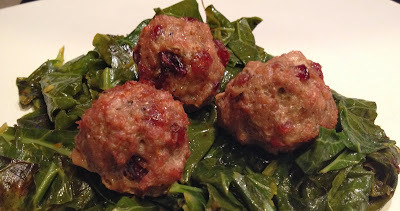 The recipe gives the option of different shapes, so I did a mix of meatballs and patties. 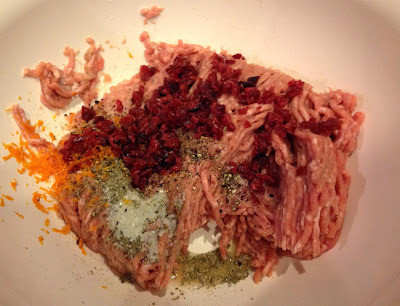 Once I formed the meat into shapes, I put them in the refrigerator to chill a bit. The mixture is super sticky, so wet your hands when you're forming the shapes (a great tip I learned from making Melissa's Dolmas). The recipe also gives the option of cooking the meat on the stove top, oven, or grill. I made these twice. The first time, I used my stove top. The second time, I baked them. Once they'd chilled, I put the meat shapes on a parchment paper lined baking sheet and I set my timer for 20 minutes. I added 4 minutes in 2 minute increments until they had the level of browning I wanted. Here they are right out of the oven. And here are a few glamour pictures are from my second attempt. Perhaps they look better with some collards? Accessibility & Cost of Ingredients: I bought the my cream of tartar in the bulk foods section at my "big box" grocery store as I didn't want a full bottle. I also couldn't find rubbed sage anywhere but the bulk spice section at Whole Foods. The rest of the ingredients you should be able to find at your "big box" grocery store fairly inexpensively. 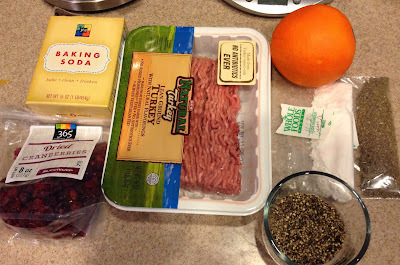 Preparation & Cooking Time: It took me 13 minutes to get the meatballs and patties ready to chill for 10 minutes. It took about 2 minutes to put them on the baking sheet. I baked them for 24 minutes. Grant Total: 49 minutes for my baking attempt. The first time I made these on the stove top I was at a friend's house who assisted me, so I didn't time myself. I'd say they took about 15 minutes to cook on the stove. Clean Up: Everything went into the dishwasher on my second attempt. For the stove top preparation, I used my friend's nearly new Le Creuset braiser. It needed some scrubbing as is to be expected with a Le Creuset pan, but thankfully, I didn't have to do it. Yay for kitchen assistants! The Paleo Review: Thumps Up! 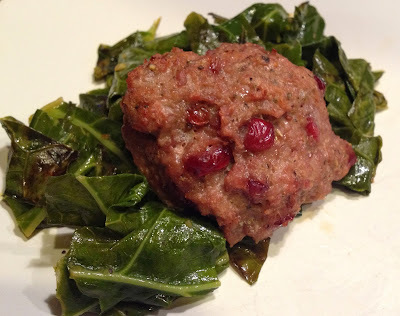 If you've been wanting the flavor of Thanksgiving without spending a few days in the kitchen, give this a try. I think its a great option for a Thanksgiving dinner for a single person or a couple. 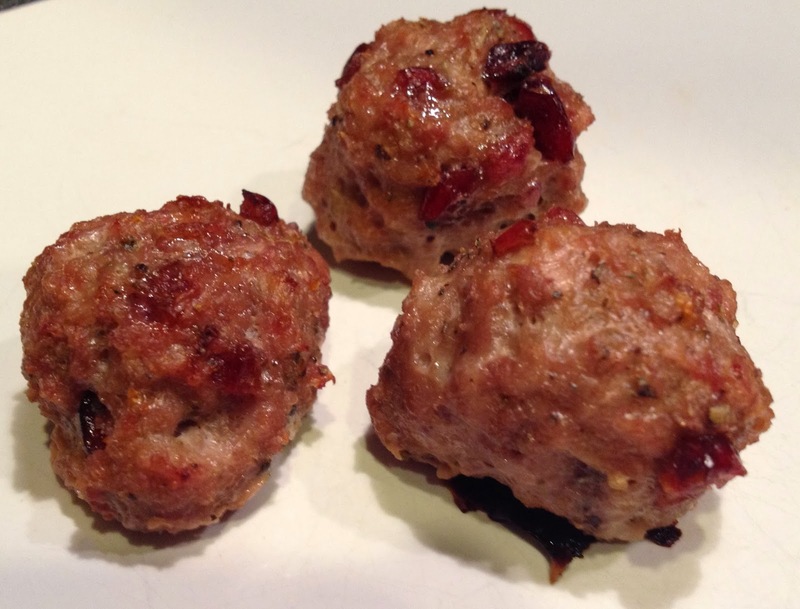 They'd even make great appetizers/finger foods for a holiday party. Having made this twice, there was a bit too much orange flavor in my first batch for my taste, so I adjusted down in the second batch and they were perfect. The orange zest is potent, so keep in mind how much you like orange flavor when you're mixing them up. When I make these in the future, I will likely bake them instead of using the stove top unless it's summer and I don't want to turn the oven on. I liked not having to turn the meat and tend the pan with the baking option. The outside of the stove top meat balls also browned a bit too much for my liking as I had to keep them in long enough for the centers to cook fully. Baking also freed me up to clean up and make my collard green side dish. Yum! If you've not picked up a copy of Well Fed 2 yet, what are you waiting for? This recipe is yet another reason to try it out.